One of the best books covering all-around topics on Lao culture. A book that was published first in 1956 in French, it was later published in English in 1959 with over 500 pages. I love the in-depth details of Lao culture this book goes into. Other current Lao country profile books these days are quite generic. You know you've seen those books where it'll cover people, environment, language, etc. in Laos but all done in a very bland kind of way. However this book goes much further into Lao culture. Covering topics such as medicine, art, festivals, rituals, to Lao games, recipes, folklore, and so fourth. It really does cover a lot. It's essentially a collection of essays written by the members of the royal family and other government officials of the time. These days you may be able to find a copy and it may be quite expensive if it's from the original printing from the 1950s (ranging from $70-200USD). But if you can, try to find a more recent reprinting - it'll be a lot cheaper! Or check out your library and borrow it for free. This is one of my all time favorite books on Laos so I highly recommend it. Full table of contents shown below and yes it's a hefty one! is this book in english or lao? i want to get this book for my dad for fathers day. The copy that we reviewed is written in English. 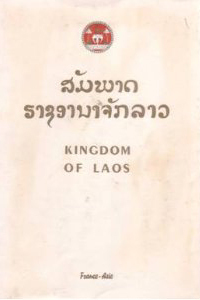 In fact there's not much Lao in it except for the cover title.